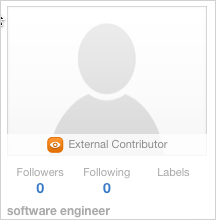 You can always tell the difference between standard community users and external contributors because external contributors have either an orange icon or orange text near their name. Whether you are searching for users, browsing through community activity or looking at someone's profile card, you can spot the external access symbol that helps you identify external contributors. An email notification also clearly indicates when you're replying to an external contributor.